Metadata is supposed to help you organise and manage your data, right? And it does, to an extent, but metadata search utilities are few and far between, and not always available right where you want them. 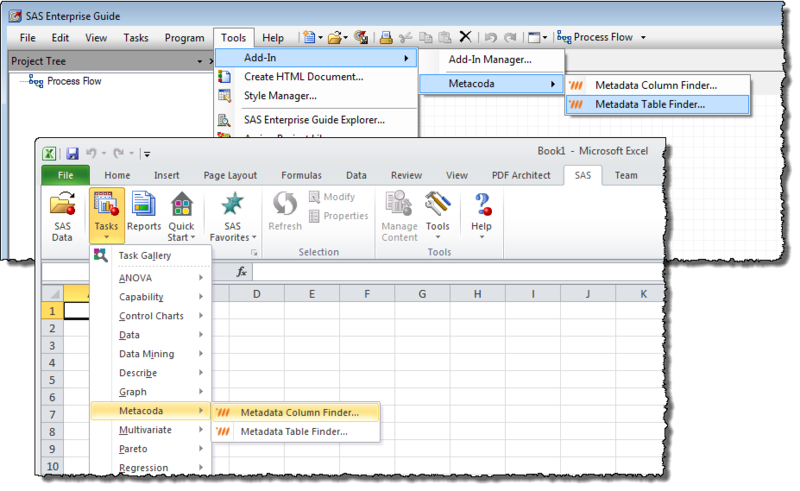 Metacoda recently released a pair of custom tasks for use in Enterprise Guide and the Add-In for Microsoft Office which go a long way towards resolving the situation. Both tasks allow you to type in a keyword or phrase relating to the table or column you’re looking for. They then search the SAS metadata and display the results, showing where the matching objects can be found. They search metadata rather than the dictionary tables and hence they find tables and columns in any metadata-defined library - even those which have not yet been assigned. Metadata permissions will naturally limit the scope of your search. The custom tasks work equally well with versions 5.1 and 6.1 of Enterprise Guide and the Add-In for Microsoft Office. Both custom tasks are free-of-charge to those registered with Metacoda. See the product page for more details on the custom tasks and a link to register with Metacoda. These custom tasks are a welcome addition to any SAS practitioner's armoury.